With all the presents opened and the last of the turkey consumed, there could not be a better time to resolve to get the children back into the old routine in preparation for the return to school. For those children already following the Tinsley House regime it is essential to get back on track and make sure the diet is spot on. Remember that both the physical exercises and computer generated treatment programs MUST be carried out on a daily basis and that all children need to burn off excess energy in the fresh air. For those parents having any nagging doubts about their child’s diet or real concerns about childhood obesity a new Dietary Advice Service is now available online. 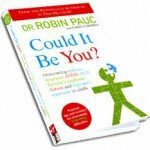 It could not be easier to schedule an appointment at a time when you are free to chat and raise any concerns with Robin Pauc in a one-to-one Skype consultation. Following a review of your child’s current diet, dietary advice and if necessary suggestions concerning supplementation will be provided. 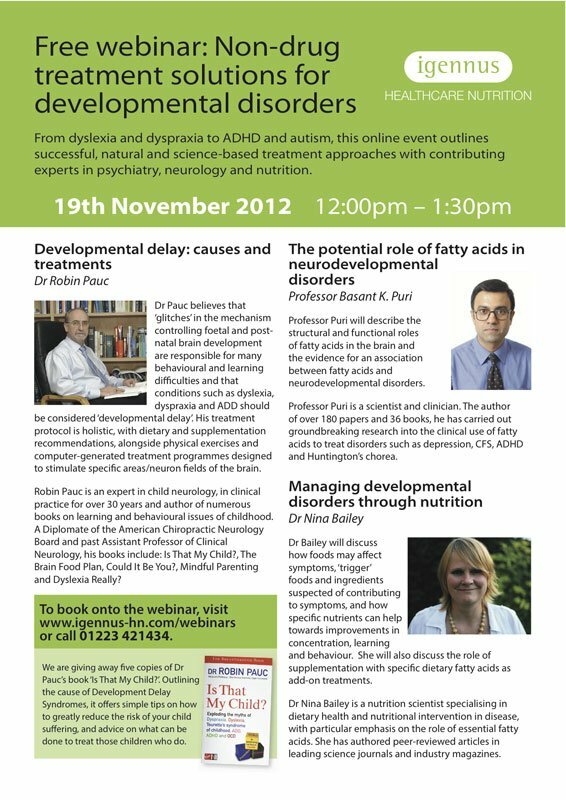 From dyslexia and dyspraxia to ADHD and autism, this online event outlines successful, natural and science-based treatment approaches with contributing experts in psychiatry, neurology and nutrition. When is Dyslexia not Dyslexia? Convergence insufficiency the inability to bring the eyes in towards the nose accurately is so common and yet unrecognized by many professionals and teachers. Read of one teacher and mothers breakthrough when she discovered that her son had this condition and that it could be treated successfully. Read the full article in the Sunday Mirror Celebs. I’m a teacher – so why couldn’t my son read? Gilli MacGregor, 43, didn’t know what to do when son Kieran struggled with his dyslexia. ‘As a secondary schoolteacher, I’m only tooaware of how devastatingdyslexia can be for children.I’ve seen bright kids become completely demoralised by the fact they cannot read. They fall further and further behind their peers, and it’s common to leave school with no qualifications. It’s a scenario no parent wants for their child. So when it emerged that my own son, Kieran, now10, was struggling to read, I was fearful for his future. He was diagnosed aged seven with dyslexia and dyspraxia, and I was shocked by how little help there was. While his reading was down on the fifth percentile, his IQ was on the 85th percentile, so he wasn’t considered far enough behind to warrant extra support at school. In fact, the disparity between his intelligence and his academic performance only added to his frustration – Kieran was bright so he knew he “should” be able to do all the things his friends could. At school he went under the radar.In a class of 33 kids, he became adept at simply “disappearing”, sitting quietly and staring out the window. At one parents’ meeting, I was very upset to be told: “Your son is lazy.” I knew he wasn’t, he just didn’t want his classmates to know he couldn’t read. Last year we reached the point where Kieran didn’t want to go back to school. It didn’t matter how many times I told him to just do his best. He saw it as torture. 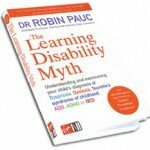 Then I heard from a friend about a programme that had helped a colleague’s dyslexic son. I’m noadvocate of “alternative” therapies, but we were getting now he rewith the usual avenues. Robin Pauc prescribed a brain-boosting diet, home computer exercises to teach Kieran’s eyes to converge properly, and physical exercises to stimulate specific areas oft he brain. It sounded wacky– for instance,he had to shuthis eyes whilewalking up anddown steps. To be honest, I was sceptical. or the vision exercises Kieran wore special glasses and had to“zap” images on the computer once his eyes had focused: a bit like “magic eye” pictures. Kieran found it extremely challenging; it took him nearly six months to master. Bribery was involved. But by the end, I could see atangible change in Kieran. His teachers reported an improvement in his concentration. Of course,that could just be him maturing. But what convinces me that this programme really works is Kieran’s reading. At the start of the programme he was 2.7 years behind. Today his reading is age appropriate. At the start of the last school year, I thought Kieran would still be unable to read by the time he started secondary school. One year on, he can read anything his friends can, and that fills him with confidence. His dyslexia isn’t magically cured – his handwriting still needs help, for instance –but he says words on a page just make sense to him now. For the first time in years, I’m looking forward to Kieran starting a new year at school. And mos timportantly, so is he’. Start every day with a healthy cooked breakfast, with good sources of protein, eggs, beans or salmon. This keeps kids’ blood-sugar levels stable, essential for children with a developmental delay. Sugary cereals are a disaster for concentration. Avoid meals that are heavy in processed carbs, such as white-bread sandwiches or white pasta – switch to wholegrains instead. And include healthy proteins too to avoid ugar slumps. Read food labels and cut out any sugary foods and those that contain artificial additives and sweeteners. Omega 3 fats can help kids with developmental delay, but for full benefitsit’s vital to also minimise saturated and trans fats (these bad fats ‘push’ good fats out). Fish oil pills are rich in omega 3, but choose supplements higher in EPA than DHA, as this is more helpful for behaviour problems. 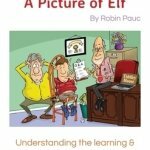 Can you help with dyslexia at home? 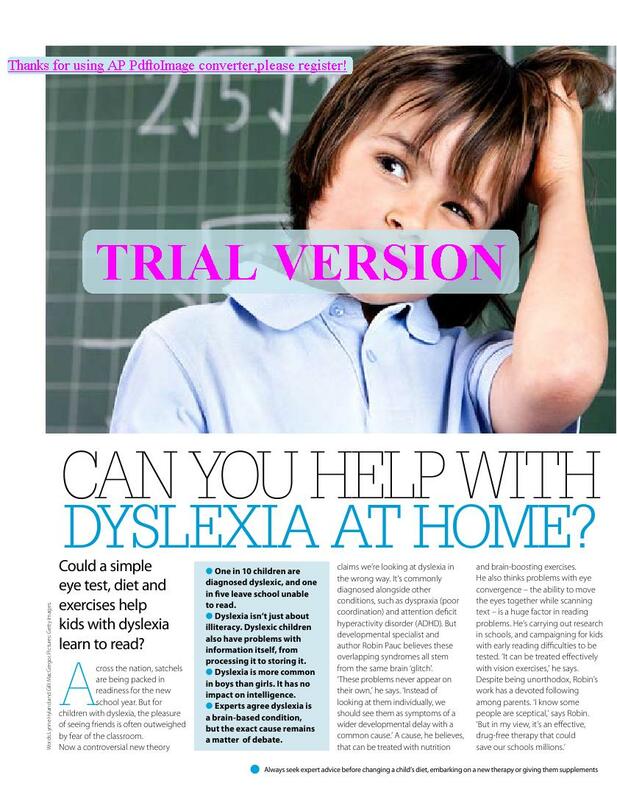 Could a simple eye test, diet and exercises help kids with dyslexia learn to read? Across the nation, satchels are being packed in readiness for the new school year. But for children with dyslexia, the pleasure of seeing friends is often out weighed by fear of the classroom. Now a controversial new theory claims we’re looking at dyslexia in the wrong way. It’s commonly diagnosed alongside other conditions, such as dyspraxia (poor coordination) and attention deficit hyperactivity disorder (ADHD). 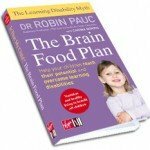 But developmental specialist and author Robin Pauc believes these overlapping syndromes all stem from the same brain ‘glitch’. One in 10 children are diagnosed dyslexic, and one in five leave school unable to read. Dyslexia isn’t just about illiteracy. Dyslexic children also have problems with information itself, from processing it to storing it. Dyslexia is more common in boys than girls. It has no impact on intelligence. Experts agree dyslexia is a brain-based condition,but the exact cause remains a matter of debate. A recent research paper published in the Journal of Child Neurology has demonstrated some very encouraging results following the administration of Vegepa E-EPA 70 to children with ADHD that were not responding to treatment with methylphenidate (Ritalin). Some improvement in behaviour and learning were noted after three months of supplementation but the greatest improvements were seen after six months of taking the Vegepa 70. WOW – Igennus do it again!! The amazing people at Igennus have just announced that a new Super Booster product E-EPA 90 will be available from late March. This brand new product provides 500 mg of EPA per capsule and is a convenient way for both children and adults who have not taken Omega 3 before to get an initial loading of EPA with fewer capsules to swallow. It is recommended that E-EPA 90 should be taken for the first 2-3 months (children under 12 one capsule a day and children12 and over 2 capsules a day) before switching to regular VEGEPA. 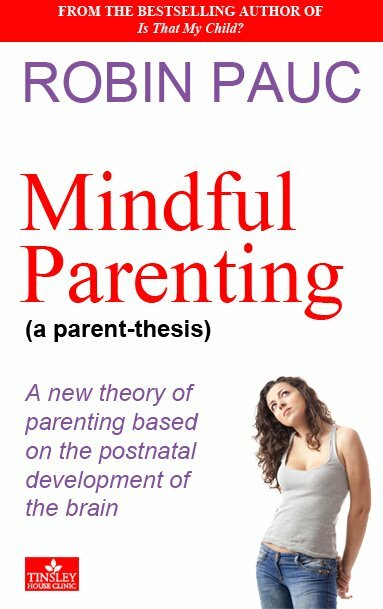 “In Mindful Parenting (a parent-thesis) best-selling author and researcher Robin Pauc looks at the postnatal development of the brain and the potential challenges this poses to parents. However, before considering the impact that a child makes upon the lives of their parents he also considers why we are attracted to certain people and not others and why indeed we fall in love. In considering the establishment of the family he looks in depth into the history of the individual members of the family unit and the effects such factors as the location of the family home and income have upon the functioning of the unit. 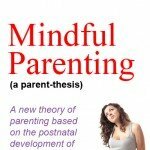 An easy to follow questionnaire allows the reader to look subjectively at their life situation and where possible make changes that will impact favourably upon the every day family life. 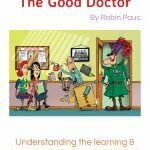 Issues with both the parents and children with learning and behavioural disorders are addressed sympathetically and case histories are presented to demonstrate the effectiveness of appropriate interventions. 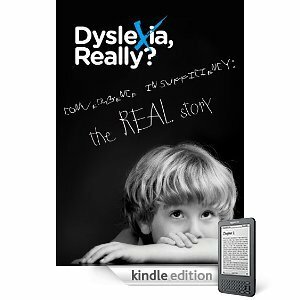 Download your copy of Dyslexia Really? from Amazon today. For a practitioner to accurately diagnose and treat a condition, he must firstly be aware of its existence, have experience of it, have the means to test for it and secondly have a treatment to hand that is known to be effective in its treatment. 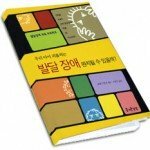 Convergence insufficiency – the inability to bring the eyes in towards the nose – affects some 13% of the population and yet very few practitioners are aware of its existence and only a handful of people have considered the possibility that it might impact upon a child’s ability to learn to read. 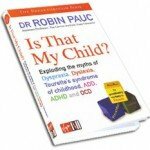 It is the purpose of this booklet to bring to the attention of parents, teachers and politicians that potentially > 30% of children currently diagnosed as suffering from dyslexia may well in fact have convergence insufficiency, a condition that can be diagnosed in minutes and treated effectively in a matter of weeks. Imagine if we could end the misery of countless children and the anguish suffered by parents of the thousands upon thousands of children potentially misdiagnosed as being dyslexic. The Tinsley House Clinic is grasping hold of the Social Media revolution and exposing the great work we do on Facebook. Over the next few months, we will be updating our Facebook page with links to case studies, information about our new campaign (Dyslexia Really?) and top dietary tips and recipes for your children. If you like what we do at the Tinsley House Clinic then please “Like” us.